Linear & Electric Actuators for Adjustable Wheelchairs | Venture Mfg Co. Wheelchair users are extremely particular about the functionalities offered by their wheelchairs. They are looking for a highly customized experience when using a wheelchair. Control and reliability are the primary aspects of wheelchair selection. Hence, reliable actuators are used in wheelchairs that can help the user control the wheelchairs’ functionality. Wheelchair actuator manufacturers are providing durable actuators manufactured using high quality materials. This reduces chances of accidental breakdowns making the wheelchair extremely dependable. Actuators are used in wheelchairs to provide the user with movement. Sitting in the same position can get tiring for wheelchair users. Changing positions in a static wheelchair can make the person uncomfortable and could lead to pressure sores. Integrating a wheelchair with actuators can help provide movement to different parts of the wheelchair, which will allow users to adjust their positions. Tilt Actuator: Tilt actuators are used for tilt-in-space wheelchairs. These wheelchairs provide movement in space. Tilt actuators are used to move the wheelchair seat forward and backward to provide movement to the user. This helps in shifting the weight, making the seating position more comfortable and avoiding any chances of pressure sores caused by sitting in the same position for long hours. Posture adjustment helps in addressing fatigue caused by prolonged sitting. Venture Mfg. Co.’s wheelchair actuators are designed to provide a rearward angle up to 55 degrees. Depending on user preference, this angle can be adjusted. Recline Actuator: These actuators are used for reclining wheelchairs. In this functionality, the backrest leans back. This system also helps in pressure management by allowing users to change their seating positions. Posture related problems can also be taken care of when using recline actuators. Recline actuators also allow passive movement of the legs and hips. Tilt-Recline Combination Systems: Tilt and recline systems work best when clubbed together. Together, these systems help in managing the pain in a more efficient manner. Postural adjustment processes are simplified as well. Tilt and recline actuators are used to provide the user with a better experience in a wheelchair. Elevating Legrests: When the wheelchair seat is moved, the legs need to be adjusted as well. Knee extensions aid in better torso movement. However, they are recommended depending on the patient’s condition and range of motion. Seat Elevators: Actuators for wheelchairs are also used to provide vertical movement. The seat can be elevated with the help of these actuators. Seat elevators do not provide any change in the angle of the wheelchair. They simply raise the seat by 12 inches or less. Seat elevators are useful when speaking to people or when looking over an object/ surface blocking the user’s vision. Standers: Patients who are able to stand can benefit from including a stander in their wheelchair. Stander actuators for wheelchairs allow users to stand and reduce the use of a separate stander. This inclusion reduces dependability and encourages standing on a regular basis. 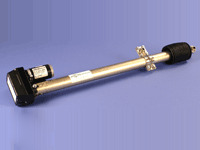 Several other specialty actuators are manufactured by us. Depending on your requirement, we can engineer an actuator that will be manufactured according to your application. 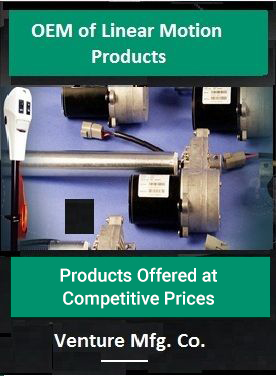 Venture specializes in manufacturing custom actuators for the medical industry. As a leading wheelchair actuator supplier, we take into consideration the end users’ needs and design our products accordingly. Our wheelchair actuators are designed to provide accurate movement. The mechanism is such that there is little to no noise in operation. Venture Mfg. Co. is the preferred wheelchair actuator manufacturer. Clients from across the globe prefer to work with Venture for their standard as well as custom offerings.